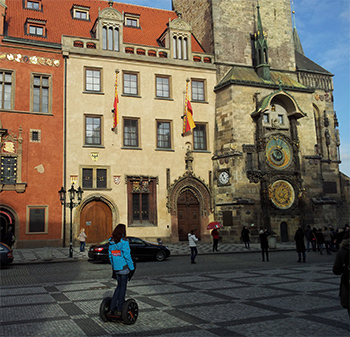 There is not indeed a memorable and significant building throughout Prague that we can on your Prague Segway tour show you, except the Prague Castle Old Town Hall before. Although its overall appearance is similar to many councilors houses, especially in its imposingness and of course its tower, with which we meet at councilors houses in almost all of our cities, for its role, as it might determine the fate of himself and certainly also for its artistic monuments that have been stored in it and that it is decorated on its exterior, stands out above all the hall not only in the country but also throughout the Czech State. Its origins are linked with the year 1338, when 18 September King John of Luxemburg allowed to Prague German burghers to buy a house and to use it for administrative purposes. That was, however, more than 100 years it took the Old Town, whose 700th anniversary was remembered in 1932, but then the steep fall events did not have to wait for themselves, in which the Old Town with its Town Hall found itself in a whirlwind of events and in their forefront. Their current, not like the wavy, underlines and alternates periods of fame and fortune with the time of sadness and destruction, but the Old Town Hall as a response, even analogy of the history of the country and nation, happy survived good and bad. Hardly the first time of its existence the high tower raised above her house with bay chapel, consecrated in 1383, as a sign of arrogance, the Old Town Hall became in the early 15th century, not only at the head of a powerful religious, national and even a social movement, as well all the urban condition, but found herself truly at the forefront of almost the entire country. And could to mark for itself Palacky Hussite movement and his sincere passion for redress moral thing throughout Christendom as the most famous period in history, to Prague and to the Town Hall the participation fells indeed the greatest. The highlight of its achievements was the event which is one of the most joyful, not only in the fate of the Old Town Hall, but also the entire kingdom, namely the choice of George of Podebrady King of Bohemia, choice, performed on 2 March 1458th. Unfortunately hall, where a choice was made, in which echoed and joyful tears, was not preserved. But in a sign of religious disputes and confusion Town Hall spent the whole two centuries. Just remember that only two dictatorships, and from the years 1421-1422, when the government of the Town Hall has authorized a radical direction with Jan Zelivsky in front and about 100 years after this repeated appearance in Prague in 1518 under Jan Paska from Vrat, which is a stormy match party took control of the two cities, the Old and New and put on house Old Town councilor keyed proud inscription Praga caput regni, the Prague is head of Kingdom. The sign we read here today. But it was only a minor incident acts against what the city and the Old Town Hall waiting for the beginning of the age XVII. After losing to Czech uprising against the Habsburgs. This time it was all about religious issues, which filled the country with new passions, but only disaster of the White Mountain led to an event in the history of the Old Town Hall belonging to the most tragic. Who would not remember the terrible theater of 21 June of 1621, the theater in which 27 leaders of the rebellion was directly in front of Town Hall punished at the throat, from which nearly half, namely 12, were Pragers. 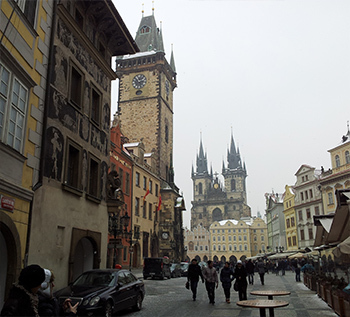 The winner of White Mountain was chosen the Town Square, it certainly was not just happen, the participation bourgeoisie, and especially from Prague, leading from the Old Town Hall, was too severe. But the day 21.VI. 1621 wasn’t not just date of humiliation of nation, finally it’s turned into a celebration of the martyrs became erasable reminder that called for vengeance. Old Town Hall, however, declined in its importance to the level of mere administrative building of any other city. It has become a tool of the imperial will, fighting against the Swedes in 1648, builds the triumphal arch upon canonization of Jan from Pomuk to St. John of Nepomuk in 1729, at the end of the XVIII. age, there focused the administration of all four Prague towns, but even though centralism brought something new, oppression of Czech language on the Old Town Hall was its heavy shadow. It was until the year 1848, the theme of which was the liberal community, allied the Prague City Hall again with population, although it’s beautiful hope proved illusory. So the October Diploma of 1860 had to come, when in fact the Prague began to live a new life, which also returned to the Old Town Hall. The first election it issued in Czech hands, because 75 Czechs were elected to the council and there would be at once rule the Czech language, if all of our people would speak at the Town Hall in Czech. At least the mayor Frantisek Pstros called on the first meeting of the council this memorable speech: “On us, gentlemen, it will depend, how far we also mother tongue next pass provide… Czech word now has the same seriousness as it always used to have only the German word. Please, gentlemen, as desired, in the debates and proposals use the Czech language and do not feel embarrassed, that the Czech language is not fluently from the mouth as German language. It’s not our guilt; it’s the fault of circumstances in which we live. It is obvious that in Town Hall the language matters was also just sensitive battleground as in many other issues, but especially religious and later political. This is why immediately with political liberalization the Old Town Hall returned to its former track, as focus of political, national and socials Czech efforts, especially at the time when the Prague towns, Old, New, Smaller, Jewish and Hradcany merge into one administrative unit in Prague, gets after connecting and other suburbs in the spirit of the times, Prague Slavic name. When the World War II, after a temporary decline of Prague, returned to capital and to the Town Hall all the advantages, which acquired already in the times of the Hussite, and gave her a new character and even a new sign on the Town Hall Mother of Cities, eloquent expression not only former its great past, but could also bring this in conformity with all the great and happy changes which brought the country and the nation the October revolution in the year: 1918th. At the end of World War II in May 1945 the was severely damaged the building, but will be restored.